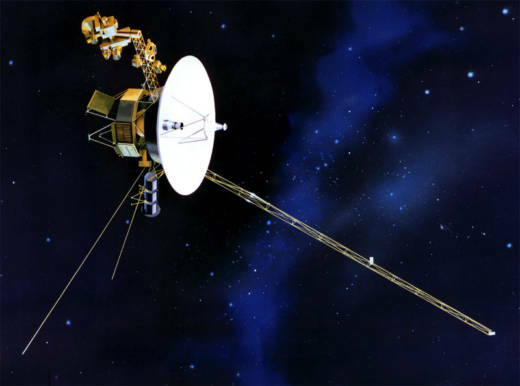 Launched in 1977, Voyager 1 is now the farthest man-made object from Earth. When NASA's Voyager 1 and 2 spacecraft left Earth in 1977, they had a mission that was possible only at that very moment in human history. The spacecraft were headed toward two of the outer planets of our solar system, and would use the gravity of one planet to swing themselves toward the next. It's the alignment of Jupiter, Saturn, Uranus, and Neptune that make this gravity swing dance possible. This alignment happens only once every 176 years, and it happened just at the time when human space technology was ready to meet the challenge. When it comes to the Voyager mission, the numbers themselves are cosmic. Voyager 1 is 13 billion miles away from Earth, and counting. Voyager 1 and 2 discovered "The Great Dark Spot" on Neptune and the first active volcanoes on another planet -- on Jupiter's moon, Io. In 2012, Voyager 1 passed across the far end of our solar system to give humanity its first taste of interstellar space. 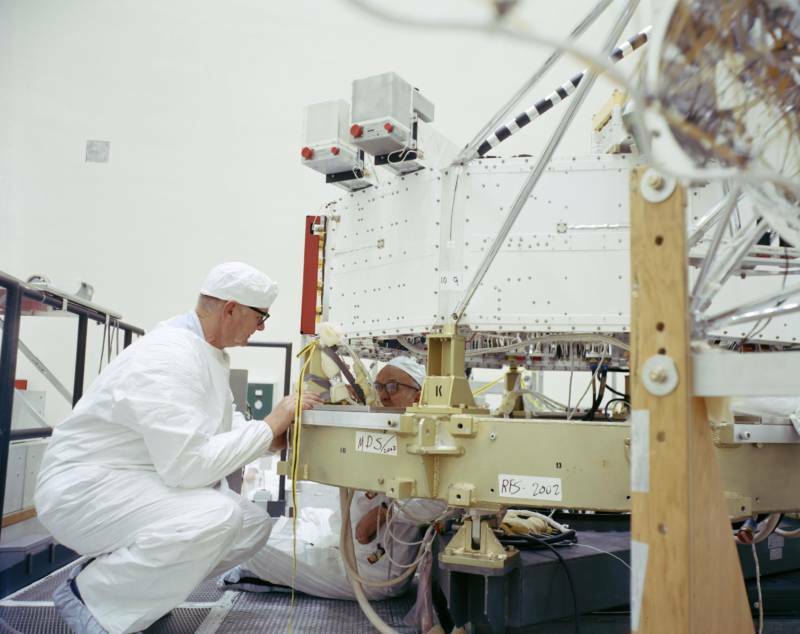 These were not among the outcomes Ed Stone could have imagined when he and his colleagues at NASA's Jet Propulsion Laboratory prepped the two Voyagers for launch in 1977. Their mission was a four-year sortie to Jupiter and Saturn -- which at the time seemed plenty ambitious. The moon landing was still a fresh memory. Now in his 80s, Professor Stone, a physicist and National Medal of Science recipient, continues to serve as chief scientist for the program he helped launch. He is also a full-time professor and researcher at Caltech. He spoke with KQED News host Devin Katayama on the occasion of Voyager's 40th anniversary. Katayama: Professor Stone, you were in your early forties when Voyager 1 and 2 launched into space. What was the original goal of that mission? Stone: The original goal was a four-year mission to Jupiter and Saturn and Titan, a moon of Saturn. And we had two spacecraft to give us a higher probability of having at least one making it on that four-year journey to Saturn. Katayama: So did you ever think the Voyager spacecrafts would last this long? Stone: None of us knew how long they would last. At the time the space age was only 20 years old. Katayama: So, 40 years later, what are some of the most important planetary discoveries to date, thanks to the Voyager mission? Stone: Well, we discovered that nature is much more diverse than we could have imagined. For instance, before Voyager, the only known active volcanoes were here on Earth. And then we found a moon of Jupiter called Io, about the size of our moon, which has ten times more volcanic activity than Earth. So time after time, we've discovered that our 'terracentric' view of planets and magnetic fields and moons and rings was much too limited. Katayama: People working in the field might not be surprised to discover how expansive space could be, but has it changed our understanding of the universe? Stone: We now understand that when bodies form, there are processes by which they can maintain a very active geological life, just as the Earth does. And the way that happens depends on the exact circumstances. So each moon seems to be quite distinct in character. 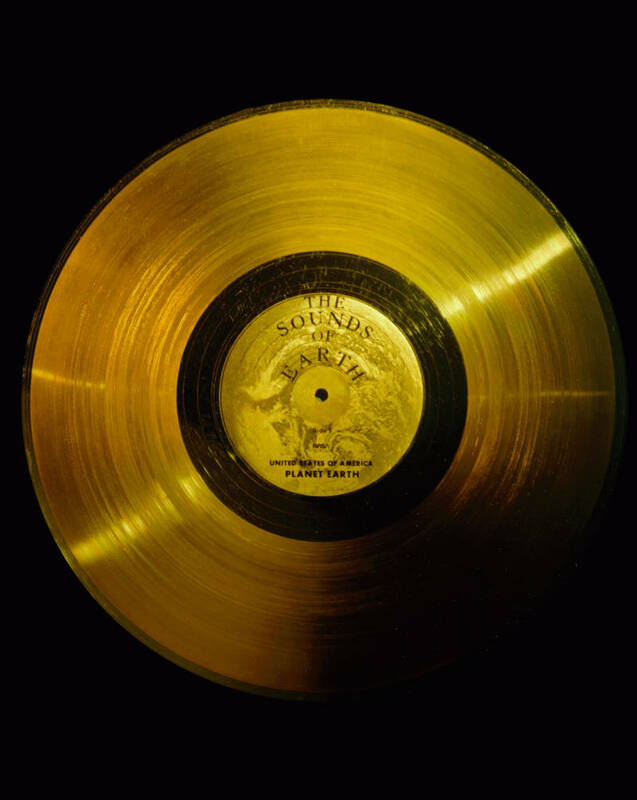 Katayama: NASA put a message on Voyager for other civilizations in outer space that might one day find it -- The Golden Record. What was the thinking behind that? Stone: It was a form of outreach. It was a declaration that we as a society here on Earth could actually send such a message, which would leave the sun, the solar system, and orbit the center of the Milky Way galaxy for billions of years, long after Earth itself may have ceased to exist. Katayama: Can you share with us what that message was? Stone: There were several messages: greetings from different languages on Earth, messages from different cultures, images of various aspects of Earth. The whole idea was to make this a time capsule, or what I call a calling card: the ambassadors Earth has sent to the Milky Way galaxy. Katayama: I'm curious whether you had any say in what that messaging was. Stone: The messaging was really determined by Carl Sagan and a small group that he put together. They did this basically over a 6-month period before launch, and it was done independently of what we were all doing, getting ready for launch. Katayama: I'm curious whether there are any questions you were hoping would be answered by Voyager that have not been answered. Stone: I think what Voyager has done is inform us well enough to know what interesting questions to ask now. For instance, before Voyager, the only known liquid water was here on Earth, in the ocean. Then we flew by Europa, another moon of Jupiter, which has an icy crust on it which is cracked -- very much like ice on an ocean. In fact, that's what a subsequent mission, Galileo, has shown. Katayama: The Voyager spacecraft are steadily losing power, and I saw a prediction that NASA will have to turn off all the equipment by 2030. What do you think should come next in terms of probing interstellar space? Stone: The next step is exploring the heliosphere itself, which is the huge bubble that Voyager left in August 2012. That is going to be done by a mission here on Earth which looks at neutral atoms coming from the outer edges of the heliosphere and from the interstellar medium beyond. That mission is now being launched in 2024. It would be the next stage in understanding the heliospheric bubble that protects all the planets in the solar system, and its interaction with the winds of the other stars as it occurs in interstellar space. Katayama: What are the biggest questions about the heliosphere that we need to understand? Stone: We need to understand the size of the heliosphere, because it breathes in and out with the 11-year solar cycle. But it will also change size as the material outside in interstellar space changes over a much longer time scale. So it's understanding how our solar bubble, which envelops the Earth, interacts and changes as what's in interstellar space also changes. Katayama: What does communication between us here on Earth and the Voyager spacecraft look like? Stone: We listen 24 hours a day; the spacecraft each have a 21-watt transmitter. We get a very slow data rate -- it's 160 bits per second, which is the best we can get from 13 billion miles away. Katayama: What's it been like having a hand in such an important mission, and having spent most of your career with Voyager? Stone: It's been a remarkable journey. Science is about learning about nature -- why it's there, why it is the way it is. And Voyager has been an overwhelming success in terms of scientific endeavor. But even more than that, the thing that's wonderful about Voyager is it's remarkably inspiring to many people, and that's of great value as well. It turned out to be a very effective way of involving the greater public in the journey, which is a scientific journey of discovery. Want more Voyager action? Check out 'The Farthest,' a new full-length film from PBS. You can live-stream it here.